Beach with Grandad = Awesome! It's holiday time! My folks just came down for a weekend! My toes are slightly cold! 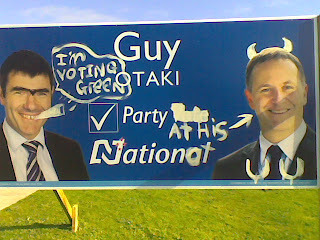 This is non-school related graffiti. 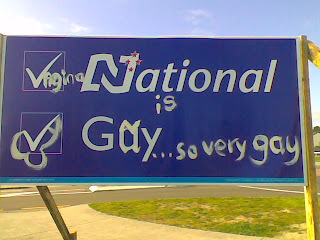 When it was last vandalised (three days ago) there was a reference to the Young Nat leader who is a student at the school. Teacher: Were you rude to that truck driver? Student: Yeah but no, cos he was rude to me. Teacher: Slowly, without getting excited or shouting, tell me what happened. Teacher: So you were sitting on something that doesn't belong to you? Student: Yeah but when he told me to get off I did but then he said he'd break me. He can't talk to me like that miss. Teacher: You were interfering with property that doesn't belong to you? Student: Yeah but I said sweet as when he told me to get off and I said I jumped off a house and I didn't break any bones so no worries, then he said he'd break me in a minute. He can't talk like that miss it's against my rights I'm gonna make a complaint. Teacher: It's not good that he spoke to you like that, but you were sitting on his gear. There's a line that you crossed and you need to apologise. Student: I'm not gonna apologise unless he apologises to me first, he can't talk to me like that it's against my rights miss. You should tell him. Teacher: (gives up) Go back into the classroom and do your work. Debbie and I rented the Snuff Box DVD from the video store over the weekend, and have been watching bits and pieces of the show over the past couple of days. It's a very odd sketch comedy show with Rich Fulcher and Matt Berry (of The Mighty Boosh and IT Crowd fame). Some of it is very good, some of it is very tasteless. Dominic is very interested in remote controls. He enjoys pushing buttons and hitting himself in the head with them, but chewing on them is what he loves best of all. I particularly like the flute-style hold he's using in this second picture. It's senior exam time at my school, and this means piles of marking! On the plus side it also means the seniors are out for a week and a half, so I only have one regular class to teach. I have a bunch of exam cover and relief lessons (including being a PE teacher yesterday, which I found tedious and inconvenient as most other kinds of relief lesson at least afford a few minutes to do marking). Not having a junior form class is also awesome come exam time - for this first time I get to enjoy the benefits of not having to run form time in the morning, or be tied to a middle of the day watch-kids-eat-lunch appointment. Today that means that I will be able to go home for lunch at lunch time (around 12), rather than at school-lunch-time which is 12.35pm. Given how hungry I am that's a very good thing. I get to be a Maths teacher for an hour this afternoon, and again next week. I actually like being a guest Maths teacher sometimes. The kids don't always love the subject but if it's a junior class and the work is easy I enjoy the opportunity to explain something concrete for a change, and enjoy the light-bulb moment (when it happens) when a kids goes from not being able to simplify fractions to being able to do it. One seldom sees such a precise step in the learning process in English (though there are moments where a kid says something like "Aha! Owen is trying to show people exactly how bad war is so they won't keep saying it's glorious!" and it is, for them, a light bulb moment. Even though it was something I'd said ten minutes earlier. And they'd read in the textbook. And we'd been discussing as a class for 10 minutes.). English tends to be about increasingly sophisticated understanding of and ability to express ideas about texts, and that's simply not as binary as can/cannot add. Debbie has more photos of this milestone which she will post some time. For now, here is a boy chewing on a highlighter. September 2008 Dom crawls from Matt Cowens on Vimeo. The kitchen is no longer out of Dominic's reach. Last weekend he sorted out crawling properly, then within a few days he was enjoying pulling up on the furniture, and he's already worked out how to climb the 2 stairs to the kitchen. Dominic Slideshow from Matt Cowens on Vimeo. This is also an example of low-impact lying down parenting. This is Dominic's first short film. It's all one take, and it's starring Dom (and the corner of my head), as he gets to grips with the camera itself and the film medium.